Our climate is changing—our range of weather is getting more extreme—and at the same time we are more aware than ever of our need to use energy wisely. The dramatic environmental, social, and economic consequences related to climate change reinforce the need to plan for energy sustainability in a way that balances growth and environmental integrity. We have been looking at energy efficient building design initiatives, but it’s time we also consider the larger impact of site planning. 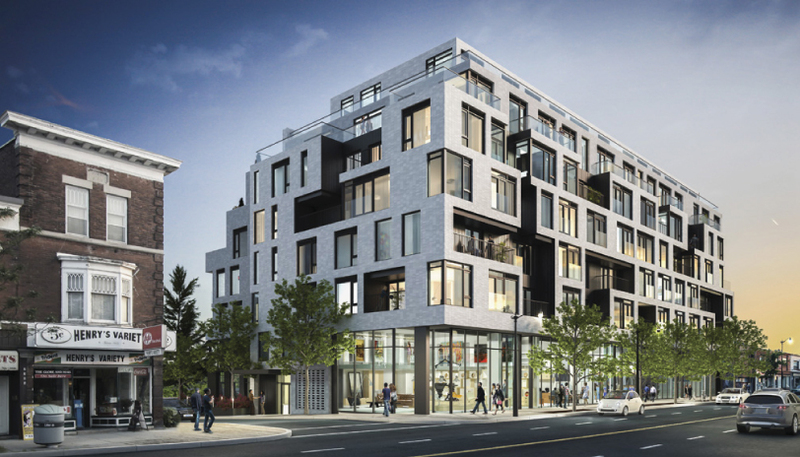 While UrbanToronto more often looks at high-density development, it is important to remember that building is rapidly taking place in more suburban locations throughout the GTA, where people are seeking larger lots and lower densities. Those communities are always going to be more resource intensive, but there are ways to mitigate that impact, and planners can evaluate how they are designed from an energy perspective. You can achieve savings in a broad sense, for example, by creating communities that are more walkable, simply by virtue of land use planning techniques that concentrate development to reduce the amount of vehicle trips that are necessary to achieve day-to-day needs. 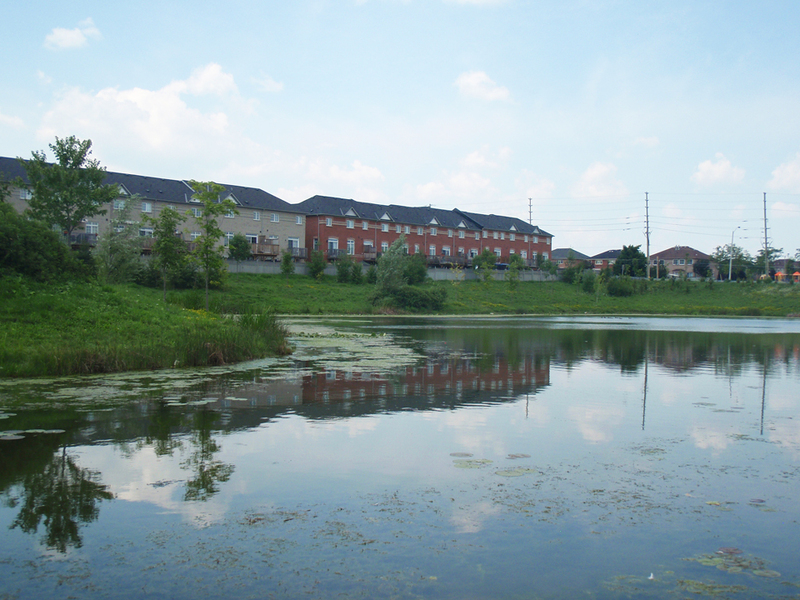 Stormwater management ponds are designed to collect and retain urban stormwater and release it slowly. Photo courtesy of LSRCA. 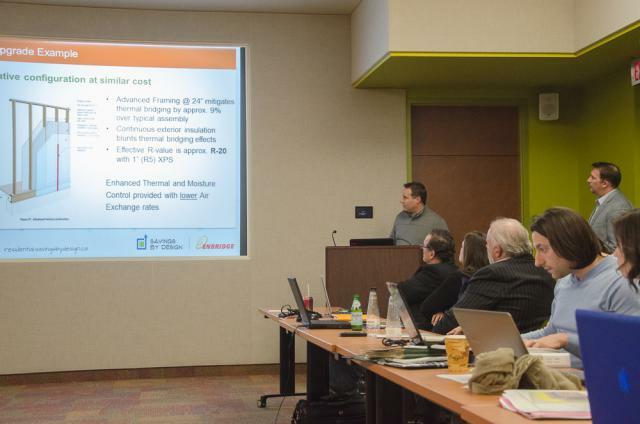 While the program is primarily driven by the energy savings of a building, with developers focused on its envelope and HVAC systems, Enbridge’s SBD program also works with municipalities to broaden the scope to address the larger site issues. 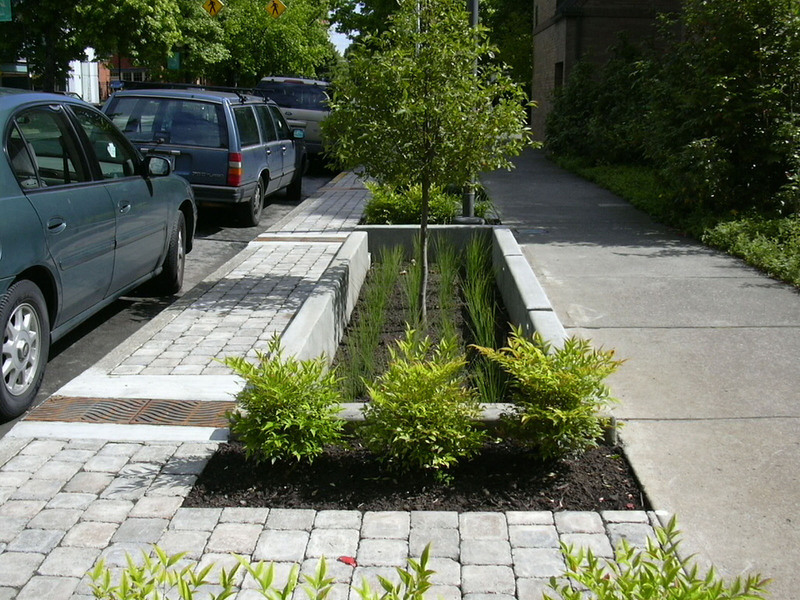 Green landscaping within impervious surfaces, such as parking lots, can help reduce runoff. 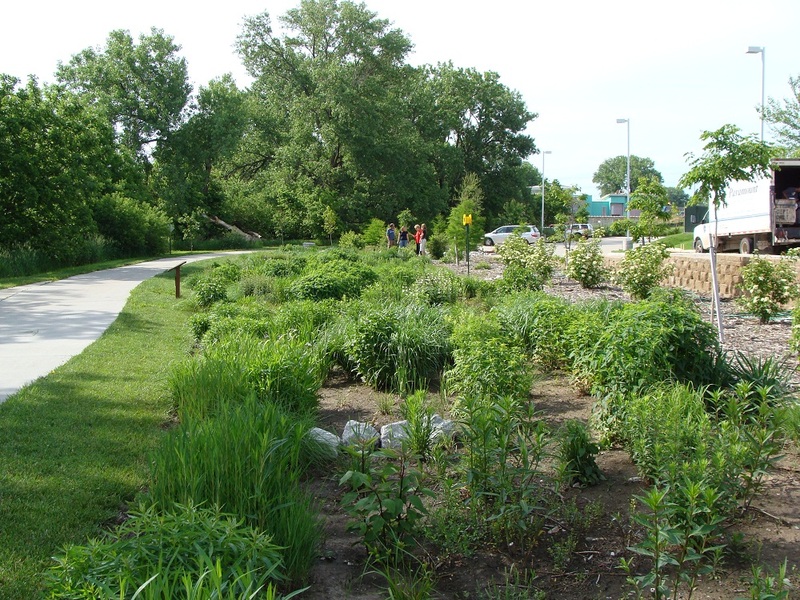 Landscaped spaces can transform street surfaces into living stormwater management facilities. Photo by Artful Rainwater Design. UrbanToronto’s Stephanie Calvet sat down with C.E.O. 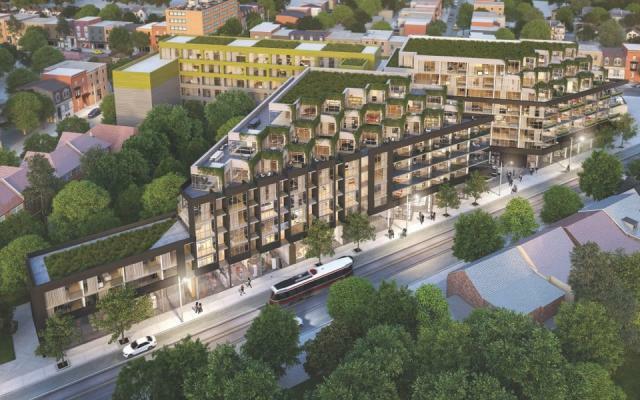 Mario Ribeiro of Triumph Developments to talk about Howard Park Residences, an urban infill project at the intersection of Dundas and Howard Park in Toronto’s Roncesvalles neighbourhood. The first phase, an 8-storey building (far right) is under construction. Now the company is bringing its Phase Two western counterpart to the market. They will be joined by a multi-storey linking element, with the common entry and courtyard located between the two. 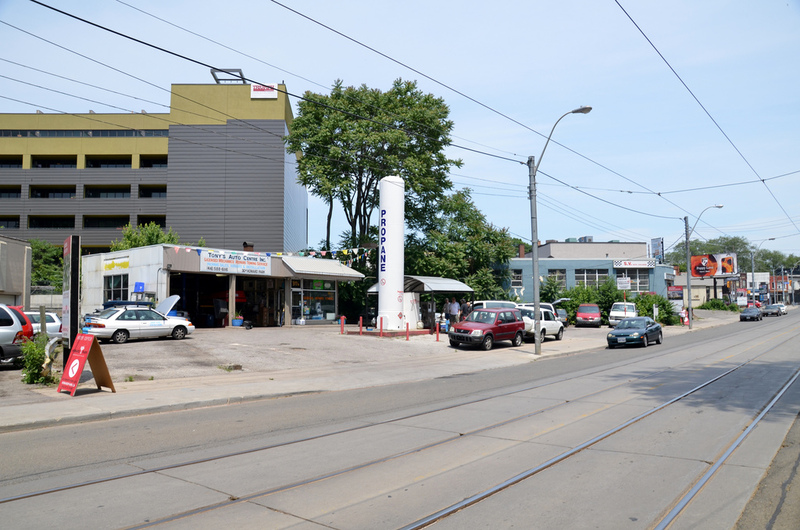 Photo of existing site – looking northeast from Howard Park Ave. 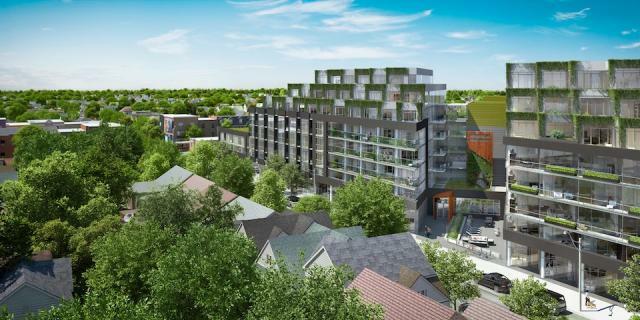 Triumph Developments’ Roncesvalles Lofts project is in the background. It was well received. 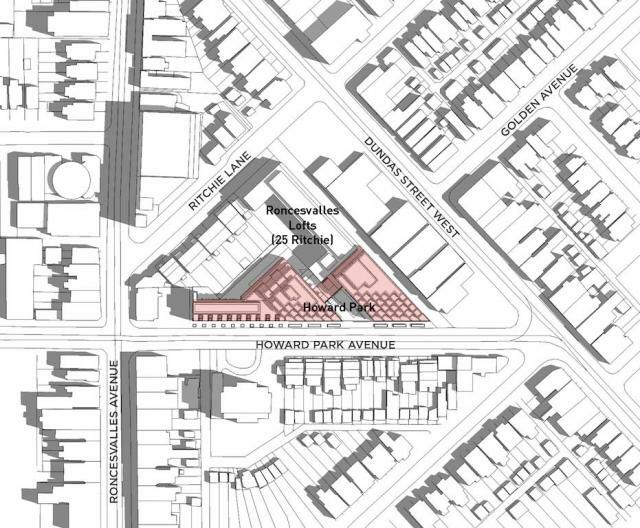 We’ve had no community pushback and lots of support from planners and the councillor. The community asked if commercial space was possible and we integrated that idea into the design. 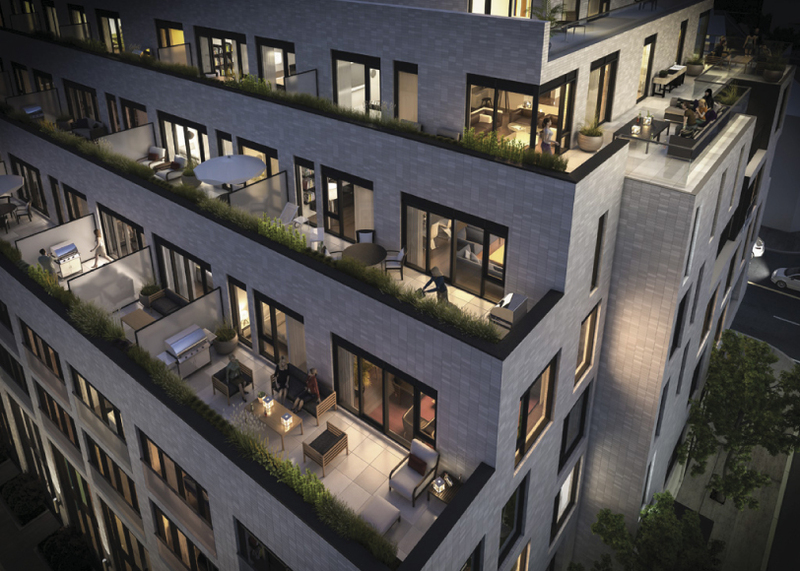 We have a vast array of styles catered to a lot of different tastes: units tailored to the young professional, units with patios, units for families, including 3- and 4-bedrooms… Our biggest unit is 1400sf. We also have five 2-storey townhomes. 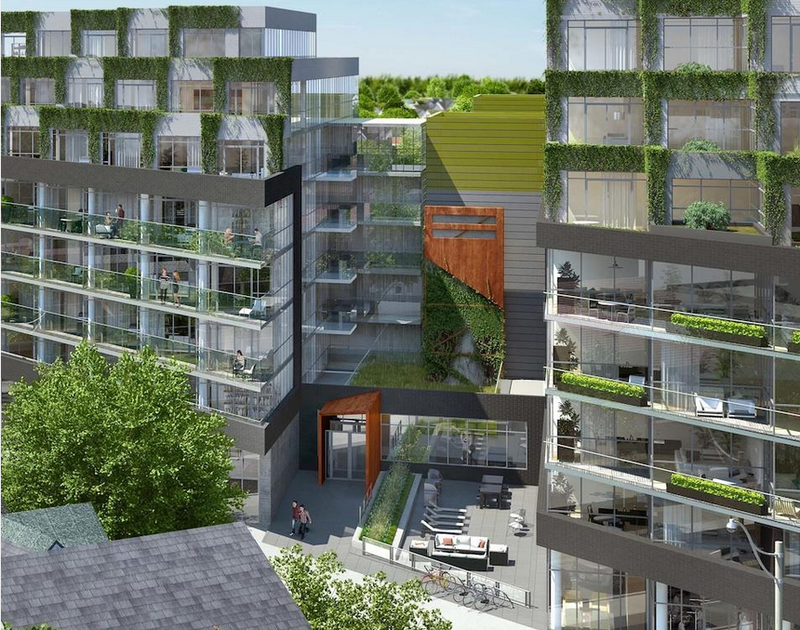 The cascading vines, green roofs and planters will be maintained by the Condo Board as part of the ‘common area’, and not up to each individual owner to maintain. That will keep it looking uniform. There is no stormwater tank but water will be dealt with on site through a combination of stormwater management solutions. It is great that parking and service access will be situated along the shared laneway off Howard Park Ave, making the lengthy (650′) Howard streetfront more pedestrian-friendly and accessible for building, townhome and retail entries. Was it a challenge to locate it behind the building? There’s a wealth of resources available for anyone minded to go the route of sustainable building, including plenty of information, best practices, assessment tools, and precedents. Builders are looking to deliver a practical, marketable and cost effective product. While developing more responsibly may be a goal for some, barriers to changing practices often come down to cost and lack of consumer awareness. Unfortunately, in the reality we currently find ourselves in, the most effective way to encourage sustainable strategies for building projects is through legislation and financial incentives. Savings By Design (SBD) is one such initiative. 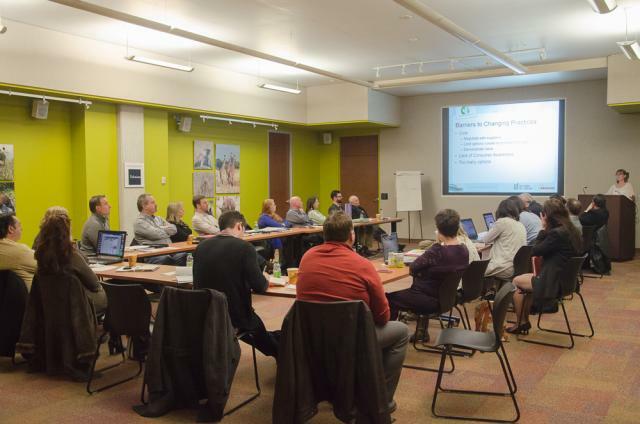 The first program of its kind in Canada, SBD was launched in 2012 by Enbridge Gas Distribution in collaboration with Sustainable Buildings Canada (SBC) to facilitate an easier transition to green building innovation. 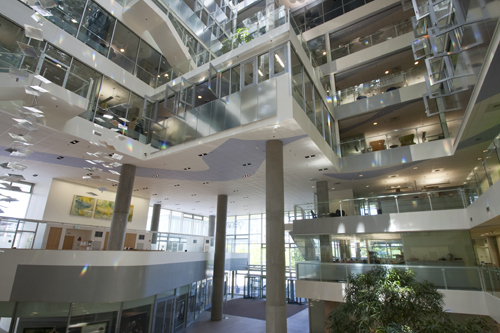 As a key stakeholder, Enbridge’s interest is in total energy savings and therefore it devised a way to help make higher-efficiency performance more attainable to commercial and residential builders by providing funding and support during the design, construction and commissioning stages of projects. It also fulfills a mandate of the Ontario Energy Board. The overarching goal is that buildings achieve 25% energy savings — or more — over the minimum requirements of the Ontario Building Code (OBC) 2012. Enbrige-sponsored IDP charrette at Earth Rangers Centre. Photo by Stephanie Calvet. 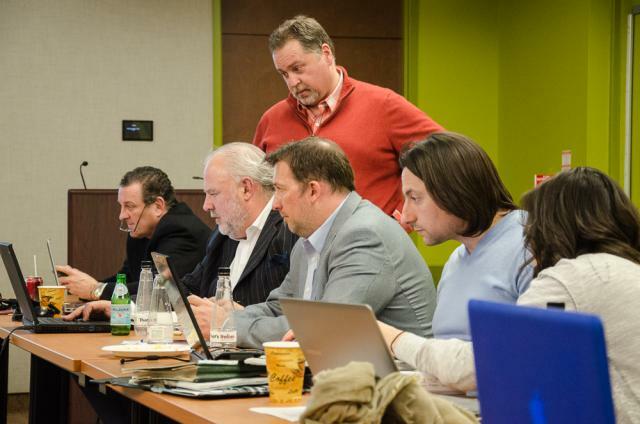 At the heart of the program is the IDP ‘charrette’, a pivotal full-day activity that brings these building industry professionals together to explore a number of design scenarios in an open discussion forum. It also gives the building team the opportunity to define priorities for improvement and to test those concepts through energy modelling. UrbanToronto’s Stephanie Calvet recently attended one of these charrettes. ‘Energy team’ charrette participants review energy modelling results. Photo by S. Calvet. 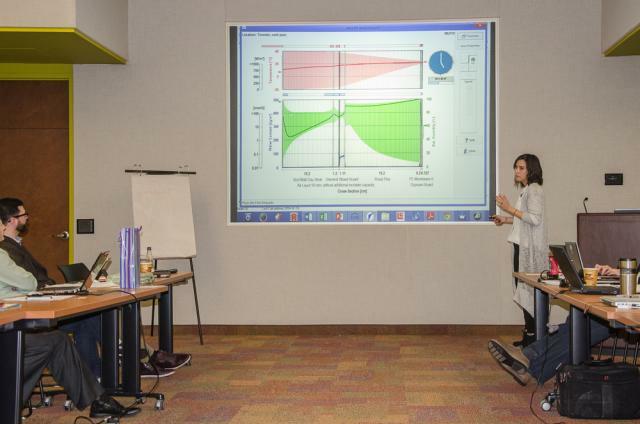 ‘Energy team’ charrette participants review wall assebly energy modelling results. Photo by Stephanie Calvet. Enbrige-sponsored design charrette held at Earth Rangers Centre. Photo by S. Calvet. 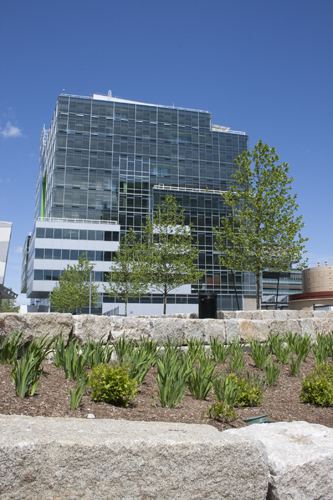 If you get the chance to visit the Genzyme Center, I say seize it. 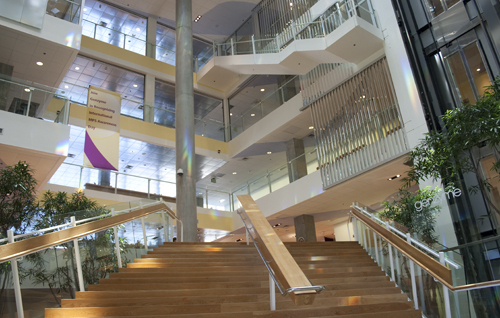 Together with other architects, I recently participated in a tour of its world headquarters building at Cambridge’s Kendall Square, a world-renowned biomedical research campus. Frequent tours are routinely conducted and for good reason: this is not your average office building. 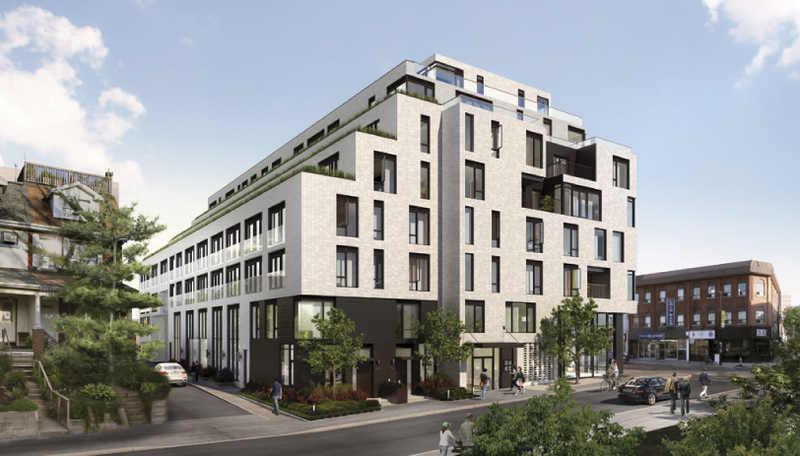 We keeners went specifically to learn how it earned a top-notch platinum rating in LEED, an internationally recognized green building certification system developed by the United States Green Building Council. 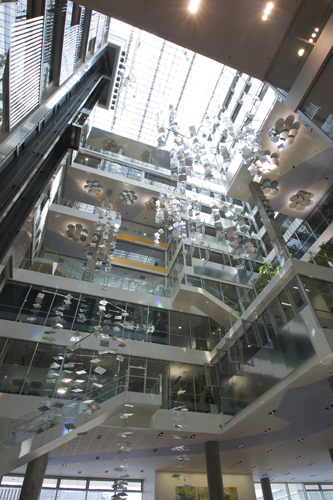 We hovered mainly in the 12-storey central atrium around which the building is organized. Dangling several stories deep, an enormous chandelier made of suspended prismatic tiles reflects and bounces light in a playful way, creating ‘rainbows’ on the surrounding surfaces and a sense of continuous movement. 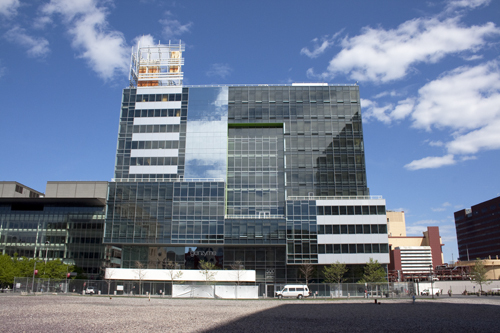 Cutting-edge technology tracks the sun’s position and with heliostats on the roof, mirrors, and louvers, light is vertically guided deep into the building. The openness of the spaces not only maximizes daylight but also enhances communication by fostering interaction among people circulating between lounges and work areas, mezzanines, ‘floating’ staircases, and glass elevators in an almost ‘see and be seen,’ theatrical kind of way. Other big selling points: interior gardens; frequently-positioned microclimate controls giving users the flexibility to control individual workspace temperature/humidity and light levels; and, a cafeteria atypically located on the uppermost floor, for all employees to partake in sweeping panoramic views of Boston and Cambridge. Sweet. Who wouldn’t want to work here? People are democratically distributed throughout the building because every spot has some environmental perk to it. Human-resource benefits of sustainable design can be profound – there are lots of data to back that up. (Mental images of happy/healthy workers toiling away).Overall this is an excellent building, highly relevant for the future. Choice client. Choice budget. And although ‘green building’ upfront costs are typically higher, there is an ever narrowing price differential between traditional and green construction. 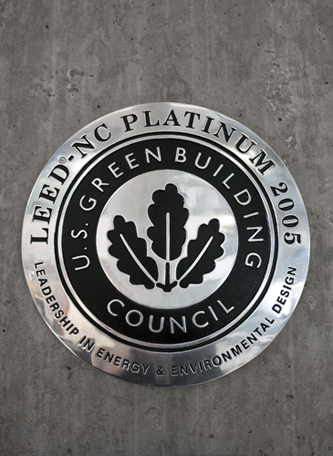 I, too, jumped on the bandwagon and obtained a LEED Accredited Professional status. 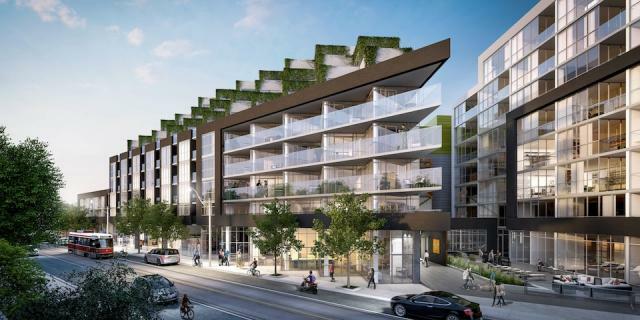 An interesting Globe and Mail article suggests that the term ‘LEED’ is sometimes banded about, willy-nilly, with developers borrowing the name for instant credibility without their project having actually fulfilled the many requirements to achieve certification. Frankly, whether a project has achieved actual LEED status or has at least pursued guidelines to build greener, the objective has to be positive-impact building. Sustainability efforts have to be integrated into the design. Architecture and beyond, it’s all the rage… everyone’s going green these days. This can’t be a fad. We’ve all got to strive for the highest degree of environmental responsibility. The challenge is to find new ways to save energy and realign ourselves with the natural world. In the words of the Artefacture, “Design will save the world”.